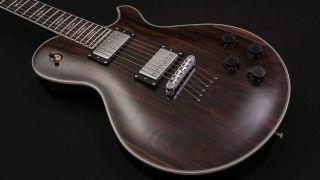 Michael Kelly Guitars' Custom Collection is a special set of limited-edition guitars with special woods, inlays and colours, and the Patriot Striped Ebony is the latest to join the ranks. Boasting a striped ebony top and mahogany body with five-ply white-black binding, the Patriot also packs a bound mahogany set neck and rosewood fretboard. Key to the Patriot's tones is MK's Great 8 boutique wiring mod - a double push/pull tone configuration, which combines with the three-way pickup selector switch for myriad tones. The Patriot Striped Ebony will be available for a limited time - with slight variations to each guitar, apparently - for $499.95.